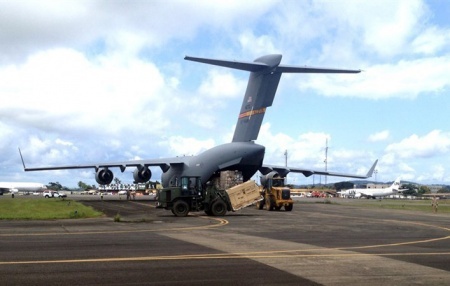 MONROVIA, Liberia -- Six U.S. military planes arrived in the Ebola hot zone Thursday with more Marines, as West Africa's leaders pleaded for the world's help in dealing with "a tragedy unforeseen in modern times." "Our people are dying," Sierra Leone President Ernest Bai Koroma lamented by videoconference at a World Bank meeting in Washington. He said other countries are not responding fast enough while children are orphaned and infected doctors and nurses are lost to the disease. Alpha Conde of Guinea said the region's countries are in "a very fragile situation." "This disease is today an international threat and deserves an international response," he said, speaking through a translator. Tom Frieden, director of the U.S. Centers for Disease Control and Prevention, said he was reminded of the start of the AIDS epidemic. "We have to work now so this is not the next AIDS," Frieden said. Elsewhere, University of Maryland researchers announced that the first study of a possible Ebola vaccine in Africa was underway. Scientists say three health care workers in Mali received the experimental shots developed by the U.S. government. First-stage human safety testing began last month in the U.S. and Britain. The Ebola outbreak is in Liberia, Sierra Leone and Guinea. Mali has not had any cases, but it borders Guinea, and health authorities there are on guard. If the vaccine appears to be safe, larger trials could be done in the outbreak zone early next year. The fleet of planes that landed outside the Liberian capital of Monrovia consisted of four MV-22 Ospreys and two KC-130s. The 100 additional Marines bring to just over 300 the total number of American troops in the country, said Maj. Gen. Darryl A. Williams, the commander leading the U.S. response. Ebola screenings: How long will airport delays be? Williams joined U.S. Ambassador to Liberia Deborah Malac at the airport to greet the aircraft. As vehicles unloaded boxes of equipment wrapped in green-and-black cloth, the Marines formed a line on the tarmac and had their temperatures checked by Liberian health workers. Meanwhile, British authorities said they would introduce "enhanced" screening of travelers for Ebola at Heathrow and Gatwick airports and Eurostar rail terminals. On Wednesday, the White House announced similar new screening measures are being implemented at five U.S. airports and border crossings. Prime Minister David Cameron's office said passengers arriving from West Africa would be questioned about their travels and contacts. Some people could be given a medical assessment and advice on what to do if they develop symptoms. Also Thursday, Liberian police used batons and rattan whips to disperse 100 protesters outside the National Assembly, where lawmakers were debating granting President Ellen Johnson Sirleaf more powers beyond those contained in a state of emergency declared in August. Her handling of the crisis has been criticized as heavy handed and ineffective. Liberian state radio announced that Senate elections scheduled for next week would be postponed. No new date was given. The outbreak has killed more than 3,800 people, according to the latest World Health Organization figures. The vast majority of those deaths have been in Guinea, Liberia and Sierra Leone. The U.S. military is working to build medical centers in Liberia and may send up to 4,000 soldiers to help with the Ebola crisis. Medical workers and beds for Ebola patients are sorely lacking. British Defense Secretary Michael Fallon said his country would provide more than 750 troops to help build treatment centers and an Ebola "training academy" in Sierra Leone. Army medics and helicopters will provide direct support. Britain will also contribute an aviation support ship. British troops are expected to arrive next week in Sierra Leone, where they will join military engineers and planners who have been there for nearly a month helping to construct medical centers. The German military, which has already been flying material such as protective clothing from Senegal to the worst-hit countries, planned to start a wider deployment of aid in mid-November. The military is expected to set up a clinic for 50 patients. Sierra Leone officials finally released a shipping container filled with medical gear and mattresses that had been held up at the port for more than a month. Ibrahim Bangura, an official who handles medical supplies, said the container's contents were finally in his possession on Thursday. Bureaucracy and political infighting were blamed for delay in distributing the aid. In Guinea, where the first Ebola cases were confirmed back in March, Doctors Without Borders warned on Thursday of a "massive" influx of cases in the capital. The aid group's center in Conakry received 22 patients on Monday alone, including 18 from the same region 50 kilometers east of the city, the group said, adding that its facilities were reaching their limits. A Uganda-born doctor, John Taban Dada, died Thursday of Ebola at a treatment center on the outskirts of Monrovia. His death brings to four the number of doctors who have died in Liberia since the outbreak. More than 90 health workers, including nurses and physician assistants, have also died. There was continued concern about Ebola in Spain, where the first person known to have caught the disease outside the outbreak zone in West Africa became sick. The condition of Spanish nursing assistant Teresa Romero deteriorated on Thursday, said Yolanda Fuentes, deputy director of Madrid's Carlos III hospital. Four doctors have been admitted to the Madrid hospital for precautionary observation, bringing to eight the number of people being monitored at the center, health officials said Thursday. In Germany, a man infected in Liberia arrived Thursday at a hospital for treatment - the third Ebola patient to be flown to the country. The St. Georg Hospital in Leipzig said the patient works for the United Nations in Liberia. The first patient diagnosed with Ebola in the U.S., Liberian national Thomas Eric Duncan, died on Wednesday. A freelance cameraman for NBC News is being treated at a Nebraska hospital after returning from Liberia.